July 1, 2012 -- Steve Torrence advanced to his third final round of the season Sunday at Route 66 Raceway, but this time he didn’t make it to the O’Reilly Auto Parts Route 66 Nationals finals at Joliet, Ill. He did, however, turn in another outstanding race-day performance that included a three-hour rain delay and was marred only by his red-light start against Antron Brown in the championship round. Torrence left 15-thousandths of a second too soon and Brown stopped the timer in 3.784 seconds at 322.88 mph. “I knew I had to push the ’tree because Antron also was running well all day,” said Torrence. “We really had a good car all day. I thought we needed to step it up a little . . . and that got me. I put the car in a little too far. He has victories in Atlanta and Englishtown, N.J. and a hold on fourth place in Full Throttle Series standings. Those are impressive results considering this was the 14th race for the Torrence Racing/Capco Contractors Inc. Top Fuel team, including three from 2011. Just six races remain before the start of the Countdown to the Championship. Torrence’s driving was flawless until the last lap. He jumped ahead of Cory McClenathan in the first round – a .043-second reaction to a .099 – and never looked back. His 3.859-second, 318.99 mph 1,000-foot time beat a traction-troubled 5.2589 at 133.13. His .054 reaction and a 3.833 at 320.36 against Spencer Massey’s .077, 3.836 at 323.77 in the next round took him into the semifinals against Hilary Will. Torrence’s quickest run of the day, 3.817 at 319.37 beat Will’s tire-smoking 7.780 at 76.85. 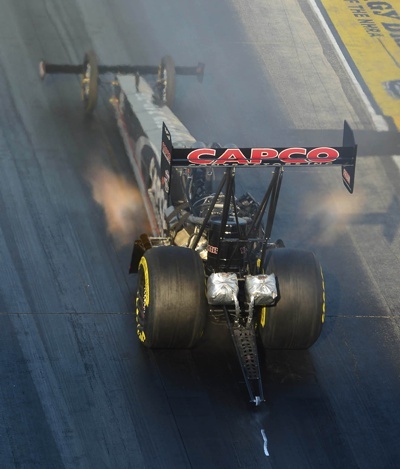 The Capco team will be back in action Friday in the Summit Racing Equipment NHRA Nationals at Norwalk, Ohio.